Scouts from a dozen NBA teams attended Sunday's game between Spain Cajasol Sevilla and Barcelona. Most of their attention was directed at Kristaps Porzingis, a 7-foot-1 center whom some scouts think could challenge to be the top pick in the 2015 NBA draft. "Porzingis, or, as I call him, 'Zinger,' is a cross between Andrea Bargnani, Pau Gasol and Ersan Ilyasova," Sevilla coach Scott Roth wrote in an e-mail to Yahoo Sports. "He is 7-1 and still growing at 19 years old. He has the total package, and, really, this is his first year of really playing, getting quality minutes and being depended on game by game. "The only thing you can say negative about him is his body is not ready and is a work in progress, which will only get better over the years. When he is 22, 23 years old he will be very good and maybe great." Porzingis had 13 points and six rebounds in 24 minutes of Sevilla's 85-74 victory over Barcelona. Willy Hernangomez, a teammate of Porzingis' and another top draft prospect, had 29 points and 13 rebounds in 31 minutes. "I haven't seen a European player with the skill combination he possesses," Sevilla swingman and former NBA player Derrick Byars said of Porzingis. "Kristaps has a [Dirk] Nowitzki-like offensive skill set. He's 7-1, can shoot, can put the ball on the floor, can block shots, he's mobile and athletic. There's not much he can't do on the floor." Porzingis was projected by some NBA scouts to be a late first-round pick in the 2014 draft before he withdrew his name. The Latvian was averaging 11 points, 4.5 rebounds and 1.5 blocks in 21.1 minutes through eight games of Eurocup play this season while shooting 56.3 percent from 3-point range. Porzingis "is a hard worker, great kid, fluent in English and loves basketball," said Roth, a former NBA player who was an NBA assistant coach with the Dallas Mavericks, Vancouver/Memphis Grizzlies, Golden State Warriors and Toronto Raptors. Here are scouts' opinions on Porzingis and the rest of the top 10 2015 NBA draft prospects playing overseas, including Congolese-American Emmanuel Mudiay. 1. 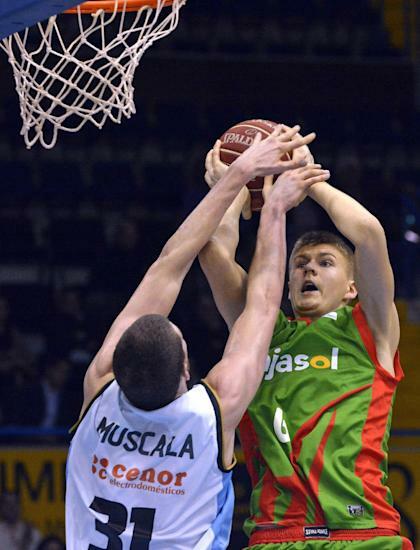 Kristaps Porzingis, PF, 7-1, 220 pounds, Spain Cajasol Sevilla, 19: "He is a top-three prospect. He's a Dirk Nowitzki-type but more athletic. He runs the floor, plays above the rim and is a face-up guy. He has a shot at being the No. 1 pick and is definitely in the top three." 2. Emmanuel Mudiay, PG, 6-5, 190 pounds, China Guangdong, 18: "He is a new generation point guard with size, athleticism and speed. … He's not a score-first guard." 3. Mario Hezonja, SG, 6-8, 200 pounds, Spain Barcelona, 19: "A swingman with really good size and strength already at a young age. Good shooter who attacks the rim. Smaller Danilo Gallinari-type who will be a better NBA player than overseas player." 4. Marc Garcia, SF, 6-6, 170 pounds, Spain La Bruixa d'Or, 18: "A decent shooter who can hit a 3-point shot. He is slippery going to the rim and gets to the basket easily. Very young." 5. Egemen Guven, PF-C, 6-11, 220 pounds, Turkey Pinar Karsiyaka, 18: "He has long arms and a nice skilled game at center with a little Pau Gasol in him. He's under control. Makes the right play. A solid midrange shooter." 6. Willy Hernangomez, C, 6-11, 250 pounds, Spain Cajasol Sevilla, 20: "His game and his body reminds me of Marc Gasol. He was recently named the Eurocup Player of the Week." 7. Ilimane Diop, C, 6-11, 215 pounds, Spain Caja Laboral, 19: "A big-time sleeper who is a great shot-blocker and rebounder. He is very athletic and runs the floor well. Lots of upside." 8. Cedi Osman, SF, 6-8, 215 pounds, Anadolu Efes Istanbul, 19: "A big-time point forward who can catch and shoot. He runs the floor well. Tough rebounder." 9. Mouhammadou Jaiteh, C, 6-9, 249 pounds, France Nanterre, 20: "A bully of a presence and a tough rebounder. Does everything under the basket." 10. Nenad Miljenovic, PG, 6-4, 200 pounds, Serbia Mega Leks, 21: "Tough, competitive guard with good ball-handling skills. Knows how to run a team. Very mature player."